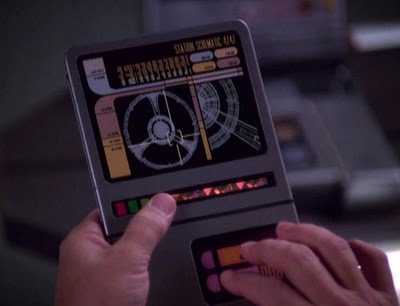 I was watching Star Trek: The Next Generation the other evening and was astonished to see Jean Luc Picard using a tablet computer device to create his upcoming lecture on archeology. (For Trek fans, this was the episode where the woman in his life "Vash" returns). I found the above image from another Star Trek episode, but the one Picard used was larger and a dead ringer for a Kindle. I checked the date of first airing: 1991. I loved the idea that what the mind imagines the world creates. I have a couple of books that I've created that have predicted events that hadn't yet occurred in real life, but did shortly after. In Running Dark I wrote about pirates overtaking a cruise liner. The pirates that we take for granted today hadn't yet taken a ship, but in the months after I had submitted the manuscript they began their kidnaping spree. My next book, The Ninth Day deals with another idea that I had but had yet to occur. Just this week I saw a splashy report discussing the issue I have written about. The book doesn't launch until October 11, so I'll keep it under my hat until then, but believe me I was astonished to see the report. Every scientist I contacted while researching my idea acknowledged that it could work, but all said it was theoretical at best. (They must have known the scientific journal would shortly confirm the idea but probably couldn't clue me in for confidentiality reasons, which I understand completely). I have a screenplay that I wrote several years ago that also deals with tracking devices in a cell phone. We had them then, but only recently have our phones had the ability to log and store locations, much to the surprise of consumers but not so much to Apple insiders. All of these ideas of mine, though, come from actual research into current events and technology and I simply extrapolate from there. Not so hard to do, really, if you have a knack for research, love reading about anything, and have the imagination to expand on the idea. But my question is this: what books have you read where the author got it right? Books that were so far ahead of their time that, when the events or future did shape up that way we kind of shake our head in awe? Got any you love? Do tell!